Joseph Lies came form a modest family. After his father, a blacksmith, died when he was 13 years old, his mother ran a hardware store. He studied at home and from 1834 to 1842 he attended the Academy of Fine Arts in Antwerp where De Keyser was among his teachers. He started painting historical subjects and genre scenes. His style was influenced by the work of his good friend Hendrik Leys. From 1842 to 1843 he served in the Belgian army. He travelled to France, Switzerland and Italy. In 1851 he received a golf medal in Brussels for "Interrogation of Joan of Arc". In 1858 he was knighted, but in 1859 he showed symptons of tuberculosis. He travelled to Italy for his health and he returned to Antwerp in 1860. He became a teacher at the Academy in Antwerp but he never fully recovered and he died in Antwerp in 1865. 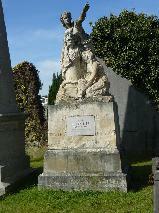 The grave of Joseph Lies at the Schoonselhof, Antwerpen.